Your help is needed in distributing REWARD posters around the island. We are asking all of our members to print at least five (5) copies of the REWARD poster that is available as a download on our website at www.paws-saipan.org. We are asking that you distribute these fliers in your neighborhood and Garapan, where the violent act took place. Also, a clarification needs to be made regarding the article which appeared in the Saipan Tribune Wednesday, January 27, 2010, about the PAWS reward for information leading to the apprehension of the individual or individuals responsible for the gruesome beheading of a cat in Garapan on or about January 24, 2010. Since NMI Crime Stoppers has agreed to assist in obtaining information on this terrible act, PAWS has agreed to step aside until such time an apprehension has been made. The $400 reward PAWS is offering is on top of any award given anonymously by Crime Stoppers, if a call leads to the identification and arrest of the person or persons who committed this act. Any and all information regarding this act should directed to NMI Crime Stoppers at 234-7272 or https://nmicrimestoppers.com/tippost.asp. Beautify CNMI! would like to enhance its web presence. To do so, we would like to continue to have the option of capitalizing on Google's various free public services, like we do now with the use of the Beautify CNMI blogspot. We would like to have a distinct email address, a public calendar and try on a different home page. Currently we are unable to do so, because someone has already registered beautifycnmi@gmail.com. Can you help us? If you are registered for this email address, we would really appreciate the opportunity to acquire the use for this unique and specific address so that we may proceed with our vision of increasing our web presence. If you have information that will help, please email to laurie.peterka@gmail.com. Thank you kindly for your replies! A few Beautify CNMI-ers got together to discuss 2010 graffiti subcommittee projects! Graffiti Busters - this is a joint project between Neighborhood Watch, Power99, TenchTech and the Saipan Mayor's Office. There will be a number of fun components with this project! It will be aimed at restoring pride at the village level. To learn how you can get involved, please contact Tina Palacios at tinasmgsaipan@yahoo.com or Eric Atalig at ebatalig@gmail.com. Beautify CNMI! Clubs in Schools - this is a project that will start first with creating graffiti awareness and then hopefully evolve into a full range of projects. If you are interested in being involved with this project, please contact Penny Hofschneider at phofschneider@gmail.com or Cinta Kaipat at cintamkaipat@gmail.com. This project needs help putting together its program structure (i.e. school principals asked for some implementation guidelines). Lighthouse Mural Project - this project is being lead by Rebecca Yost of Whispering Palms School. Becca is currently looking for assistance with clearing weeds, jungle over-growth and debris. For more info or to help her with this project, please email her at beccayost@gmail.com. If you have other questions or graffiti related projects that you would like assistance with, please contact Tyler Yoshimoto at tyler_yosh@hotmail.com. For general inquiries about Beautify CNMI! please contact Cinta Kaipat at cintamkaipat@gmail.com or Laurie Peterka at laurie.peterka@gmail.com. 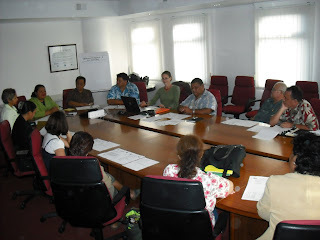 Beautify CNMI is an environmental coalition organized into committees. Each committee has one or more chairpersons who are responsible for setting goals and organizing committee projects. Please direct general inquiries to Laurie Peterka. Pacific Islands Club Saipan designated PAWS & Beautify CNMI! as the recipients for all proceeds from its 2009 PIC Palooza party. The event raised an amazing $5,000 with $2,500 going to P.A.W.S. and $2,500 going to Beautify CNMI! The use of these funds will be determined in the next Beautify CNMI! meeting, scheduled for February 11, 2010 at 6pm (location TBA). In the past, donations such as these were used for purchasing trash bags, gloves and water for various clean up activities. THANK YOU PACIFIC ISLANDS CLUB SAIPAN! We hope that you will find time to join us on Friday afternoon as we kick off 2010 with a brainstorming session. Our first priority will be to establish (or re-establish) our 2010 committees. Each committee will then be responsible for establishing its projects and goals. Beautify CNMI consists of a colition of like-minded people interested in coming together to create and work on projects that improve the overall beauty of our home and generally improve our quality and standards of living. There are no specific membership requirements. Committee leaders meet monthly to collaborate and report on project progress. To join, all you have to do is get involved! Show up at a meeting or volunteer for a project or start your own project and then look forward to getting support from a wide-range of experienced community members. Everyone and anyone who has a project idea or existing organization related to the beautification of the CNMI is encouraged to get involved with Beautify CNMI! Any organization looking to establish a partnership with Beautify CNMI is encouraged to bring ideas to Friday's meeting. ANGELO Villagomez (aka KungFu Panda, to some of us) is departing for a while to earn himself a few more smarts, to broaden his experiences even further, and to spend some time closer to immediate family. Many, many people have been touched in some way or another by Angelo's presence these last four years in Saipan and, to listen to so many people in the community, it is quite obvious that he and his infectious spirit will be missed. The count down is on and Angelo is making the most of everyday while also packing boxes and selling off his unpackable stuff. If you know someone who might want to know about this event, please pass this information on!